They say that small children, babies in particular, experience a sleep regression prior to developing a new skill. With my son, I spent time playing around with the Wonder Weeks app and e-book, staying up to date on what was supposed to come next. With my daughter, I can barely remember how many months old she is, let alone how many weeks old. I have spent the better part of this move keeping track of my stress levels, so as to not impact the children too much. Children feed off stress, and the last thing I wanted to do was to contribute to M having more anxiety, or E starting to experience baby-anxiety. So, I have done quite a few breathing exercises, while remembering the mantra, “Jesus, I trust in You.” I know God has a plan, and ultimately, it is His will that will be done, not mine. So, I have been relying on that belief. Last week, E stopped sleeping through the night. For several nights, every. single. time she was put down, no matter how gently, her eyes would pop open and she would cry until she was being held again. Try as I might, I couldn’t quite figure out how to lower my stress level, especially beginning to become sleep deprived since I was holding E more hours than I was sleeping, so as to facilitate her sleeping. Until she achieved her next milestone – sitting up on her own. You see, I forgot that sleep regressions accompany milestone achievements. So, while she was working on staying close to her mama, because she was getting ready for a new step in her development, I was beating myself up for not keeping my stress levels in check. I now have my precocious preschooler, and a little girl who is working very hard to catch up to her big brother. I am so thrilled to see another milestone under E’s belt! Day one of sitting up on her own. She went from 0-60, similar to her brother’s rate of milestone achievements. 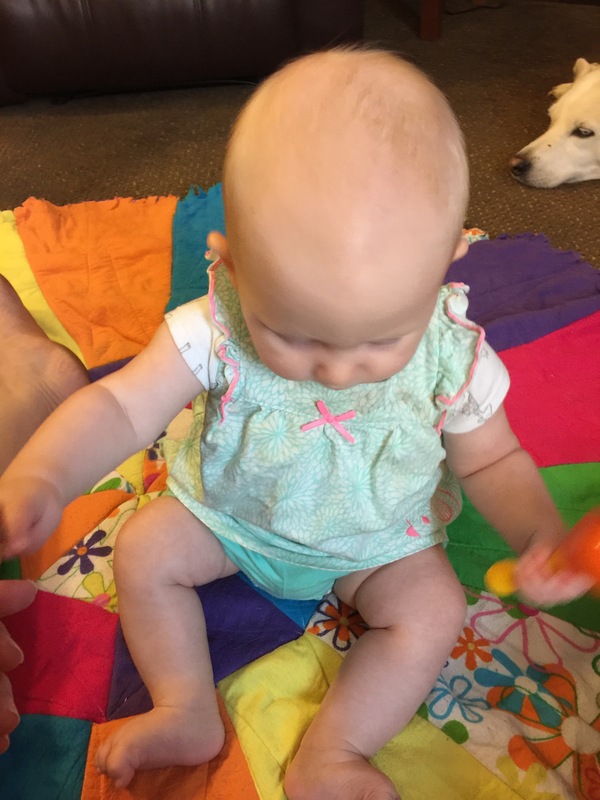 Posted on June 23, 2016 June 21, 2016 by Anni HarryPosted in Adventures in ParentingTagged Babies, Breathing, catholic, Children, christian, Developmental Milestones, Faith, Family, motherhood, Parenthood, Parenting, Prayer, Stress Reduction, Wonder Weeks. you’re doing a great job, Mom! these things may seem little though significant to the ‘right now,’ but they will become HUGE in the long run b/c they will add up. all the times you choose to lower your stress, to hold your baby, to play with your preschooler, like pebbles placed in a jar, they will multiply and become foundations for both you and your children. Thank you for the imagery! Thank you for your encouragement! A good note for anyone who has kiddos. How old is your daughter? She’s beautiful! I’m experiencing sleep regression now and my daughter just turned 3 months last Saturday. I like your advice about breathing through it. Sometimes I stop breathing out of worry. My little one is almost 5.5 months old. There is a huge sleep regression at 4 months – just to warn you. But, like I mentioned, they usually coincide with a new skill being learned! When that skill has been mastered, they seem to go back to sleeping better… Here’s to a quick mastery for your little one!! She’s learning to roll over so that must be the issue. The doctor said that sleep regression can start as early as 3 months and as late as 5 months.